Trees moderate climate, conserve water and provide habitat for wildlife. Trees reduce the heat island effect caused by pavement and buildings. Properly placed trees can increase property values. The Tree City USA program is sponsored by the Arbor Day Foundation in cooperation with the National Association of State Foresters and USDA Forest Service. 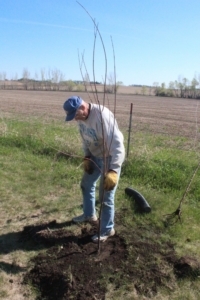 The City of Rock Rapids commemorated Arbor Day 2016 on August 30 with planting of two Autumn Blaze Maples at the south side of the Soccer Fields. Picture shows Tree Board Chairman Evan De Boer planting Autumn Blaze Maple on Arbor Day.